Happy Monday to all you alls out there. It's Kelley Dolling from Teacher Idea Factory. I am coming at you today with a punctuation post. 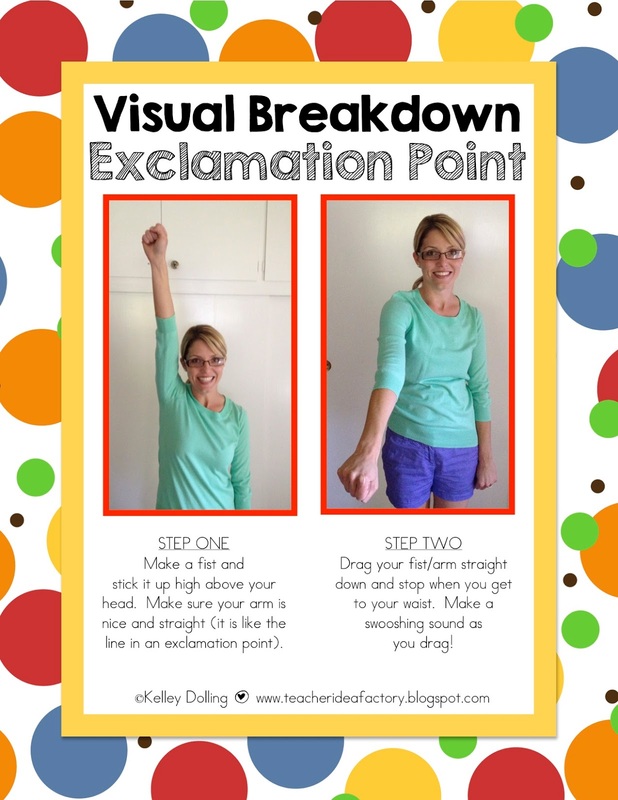 K-2 teachers (and even in the higher grades), battle that sentence starting capital letter and the end punctuation mark all year long. 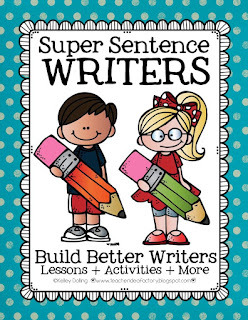 If I only had a dollar for every time I asked a little kiddo, "Sweetie, how do you start/end your sentence?" I know you all are with me. We say it until we are blue in the face. I am all about adding that kinesthetic movement to lessons . 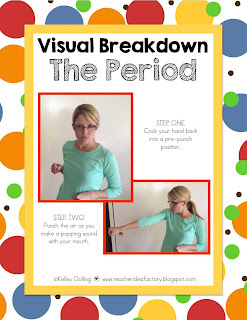 . . it creates an emotional response for kids and drives attention. 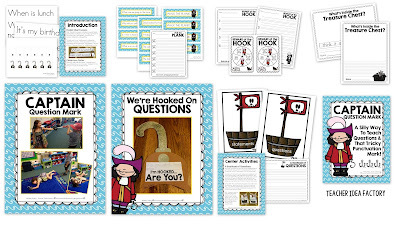 Not only does it help lessons and standards "stick," but it also adds a super element of fun (something every primary kiddo needs). 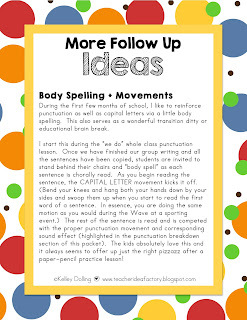 With all of this said, I have incorporated movements into my kinds of sentences lessons. 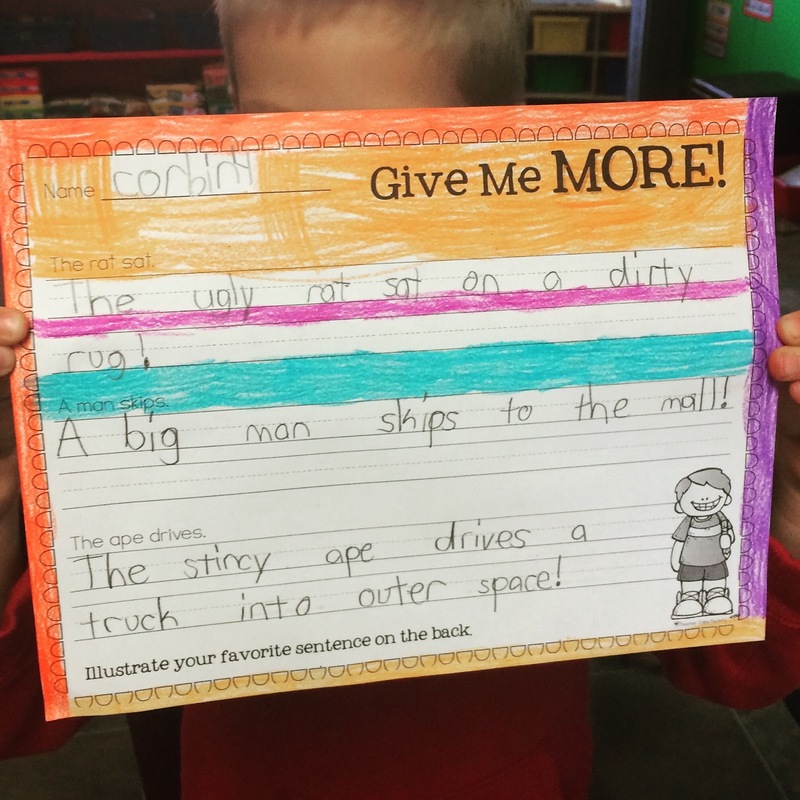 The kids read sentences we have written together during whole class writing instruction and punctuate them with silly movements. I don't think I am explaining myself all that well . . . let me show you. Meet The Period or Full Stop (for my Australia pals). This one is a quick popping noise as you gently punch the air. This one is filled with excitement and feeling (duh). It's all about the facial expressions and voice pitch too. Confusion is the key to this mark. Hopefully, this visual does a better job of explaining what I am getting at this morning. (I just poured my second cup of Joe . . . I have to be getting a little clearer.) So, after we add more details to silly sentences like this . 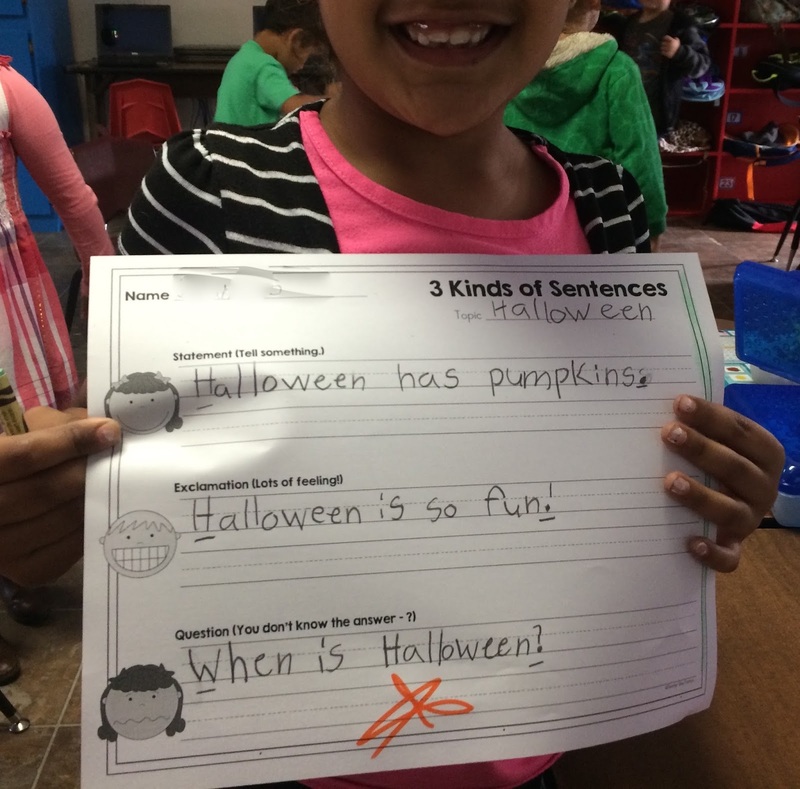 . .
Or, practice writing different kinds of sentences like this . . .
We body spell our sentences like this . . . If you like the flavor of these movement ideas . 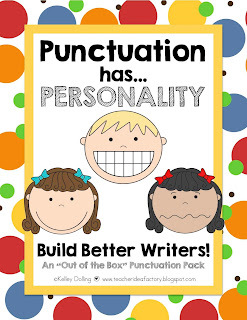 . . check out the rest of my Punctuation Has Personality Pack. I just discovered this gem of an idea . . . the kids use a blue pen to start a sentence. Um, duh!!?? Primary kiddos dang near cut of a limb to have the chance to write in pen. I know my babes aren't going to forget to grab one to start a sentence. The cool thing is that this process is temporary. Once students get into the routine of using capital letters, you transition away from the whole pen it in thing. This new idea blows my mind. Before we get down to business with any practice, the kids will be introduced to "Captain Question Mark!" Here's how I use this one . . . 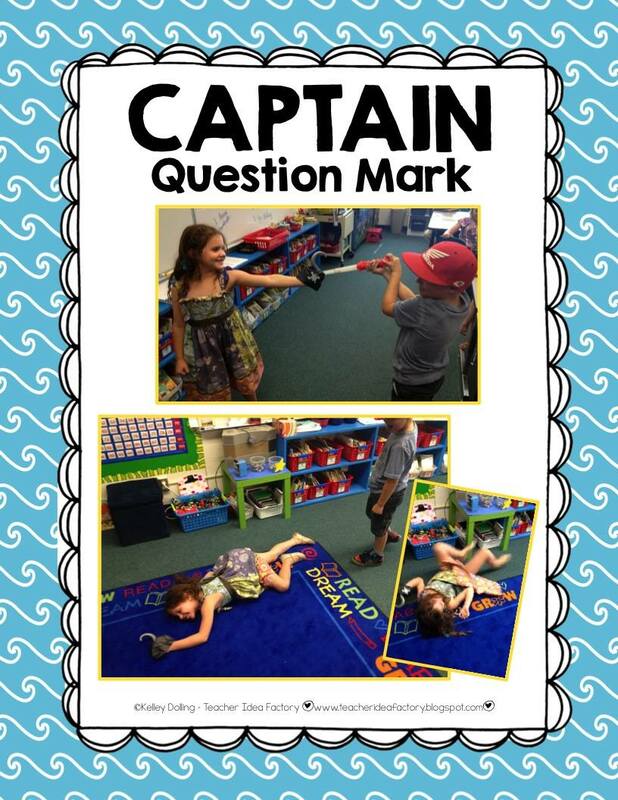 Pick one student to be Captain Question Mark and give him/her to toy pirate hook. Point out that the hook looks a lot like a question mark. Select another student to play the part of Peter Pan and give him/her something to "fight" with -- I used an old lightsaber. Point out how the HOOK is facing all of the action. Then, instruct the Captain to turn his/her back on Peter. Point out how the hook is NO LONGER facing the action. Let Peter safely "take down" the Captain. It helps if you pick a real ham for this part. Last year my sweet little gal got poked in the back and put on an Oscar-worthy performance. She flopped on the ground, rolled around, and played dead. It was classic! Once you "put the lid back on," follow this up by saying that Captain Question Mark ALWAYS has to face the action (i.e. the sentence). 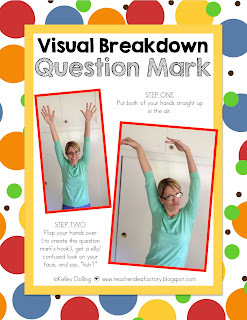 Use the play hook to help punctuate a question that you wrote on the board. This extra visual helps solidify it. This is one of my favorite lessons of the year. The kids are absolutely delighted and it helps eliminate most, if not all, backward question marks. I know it's a grand statement to make, but there is just something about the memory of Captain Question Mark that triggers appropriate punctuation. To read my whole question writing post . . . CLICK HERE :) It's an oldie but a goodie. I always extend my lessons with a whole pirate theme now. It just works for the little guys. Finally, a little art project highlighting all of the elements of a complete sentence is the perfect way to draw in a few "littles." 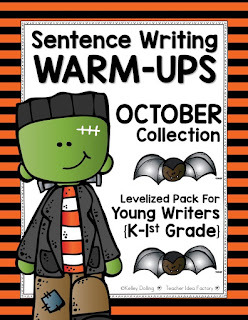 Stephanie Stewart has a Complete Sentence Buddy Freebie that I run with every year. It's cute. It's simple. It makes the best learning-based bulletin board. AND . . . kids "get it." Alright, there you have it. A post all about reducing basic punctuation errors. All in all, these tricks have worked well for me over the years. 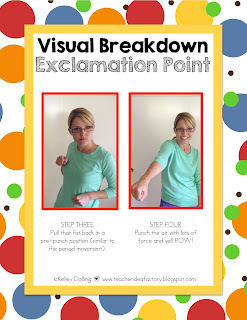 Again, I am not saying that these will solve ALL of your basic punctuation issues for EVERY student you have or will ever have. However, each of these tricks will hook a handful of kids in a different way and save you from putting the "How do you start/end a sentence?" on constant replay. 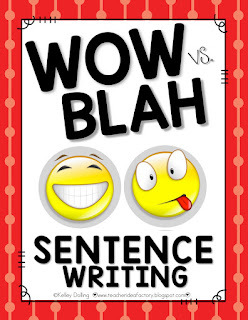 If you are looking for additional sentence writing and/or punctuation resources, pop on over to my shop and check out my WRITING section. 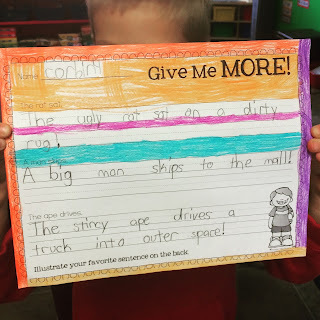 I have to say that writing is my absolute favorite subject to teach and I have oodles of "out of the box" and VERY kid friendly ideas and activities to share with all you alls. Here are just a few . . .